Dirac held the Lucasian Chair of Mathematics at Cambridge University, a position also occupied by such luminaries as Isaac Newton and Stephen Hawking. Yet, during his 40-year career as a professor, he had only a few doctoral students due to his peculiar personality, which bordered on the bizarre. Taciturn and introverted, with virtually no social skills, he once turned down a knighthood because he didn't want to be addressed by his first name. Einstein described him as "balancing on the dizzying path between genius and madness." 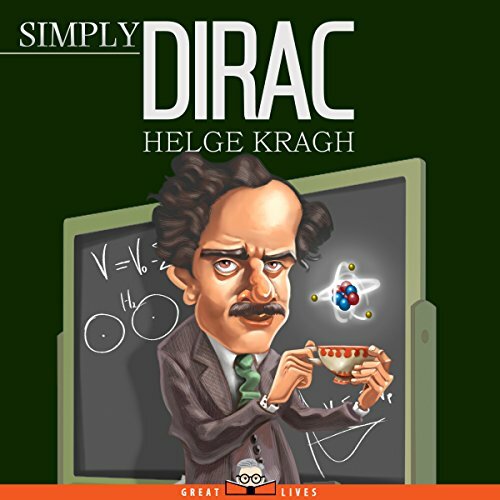 In Simply Dirac, author Helge Kragh blends the scientific and the personal and invites the listener to get to know both Dirac the quantum genius and Dirac the social misfit. Featuring cameo appearances by some of the greatest scientists of the 20th century and highlighting the dramatic changes that occurred in the field of physics during Dirac's lifetime, this fascinating biography is an invaluable introduction to a truly singular man. This is a very interesting book for those who enjoy knowledge and science. It is a fascinating biography that blends the scientific and personal life of Paul Dirac, a brilliant mathematician, 1933 Nobel laureate, and author of the book The Principles of Quantum Mechanics. I liked very much the clear narration and British accent of Jack Wynters. I received this audio-book free for an honest review by the author, narrator, or publisher. What did you love best about Simply Dirac? All I knew of Dirac before listening was that he was a physicist that taught at the University of Miami. I had no idea that Dirac worked with Schrödinger and that they both received a Nobel Prize in Physics. I also didn’t know that after publishing his fundamental papers, Dirac was referred to as the “wizard of quantum physics.” The audiobook explains the Dirac equation and “all his energy went into the establishment of Quantum Mechanics.” It also explains his quirks as a scientist. This reminded me of a character of the Big Bang Theory. I'm sure the writers of the show took a lot of inspiration from Dirac. What other book might you compare Simply Dirac to and why? After listening to Simply Darwin, I was looking forward to delving into the life of Paul Adrien Maurice Dirac and his scientific discoveries. Just like in Simply Darwin, the audiobook is short and to the point about the scientist’s life and discoveries without being unattainable to those without a foundation of subject. I only knew very little about Quantum Mechanics. Which character – as performed by Jack Wynters – was your favorite? The narrator Jack Wynters is great. He is professorial in his tone and he is very easy to follow. I purchased "Brexit. The Tip of the Populist Iceberg?" based on his narration. I was voluntarily provided this audiobook by the author, narrator, or publisher, but that did not affect my review. I'd never heard of Dirac before this audiobook, but he was very interesting. This was a very simple introduction to Dirac, and I'm pretty glad that it was a 'simple' introduction, because parts of it could be quite confusing. I had probably heard of P.A.M. Dirac when I took physics back in high school or college, but really didn't remember anything about him. The author states that in order to read/understand/enjoy this book, you really don't need a physics background. I disagree; this book is heavy on the study of physics, especially Quantum Mechanics. The more that I read about brilliant scientists & their discoveries, the more I am convinced that their brains work in a totally different manner than the brains of us normal Joes. I would recommend this book only to those who are heavily into physics and/or biographies of scientists. I was provided a copy of the Audible version of this book by the narrator/publisher/author and chose to review it. The narration was excellent; without his ability to engage the listener, this book would have been difficult to finish. Yes, good look into an astounding and brilliant wizard. Fascinating read. I was worried this would dry and dull but I loved it. Well told. Great read. A fascinating introduction to a brilliant man and I intend to now find a fuller account (one by the author and another more recent by another writer are mentioned at the start). I would say that a listener would benefit from at least a certain amount of physics and maths knowledge to understand the significance of Dirac's work and that of the others mentioned. I am an undergraduate maths student but have little knowledge of physics beyond some Newtonian mechanics in applied mathematics and I couldn't follow everything mentioned regarding the physics theories, but this did not stop me enjoying the book, and it may be only a fairly basic knowledge of physics (or perhaps just the willing to Google certain terms) would enable the listener to understand fully. Again at least some knowledge of mathematical terms is really needed to fully understand some of the references. However I think the book can be enjoyed without this, it will just be a little harder to follow at times or to fully appreciate the importance of what is being discussed. I really liked the narration and felt the narrator was a good choice. Please note, this audiobook was given to me by the author, narrator, or publisher at no cost in exchange for an unbiased review. I had never heard of the subject before but the book description sounded interesting. It was interesting and much more. A quirky Nobel prize winner full of amazing theories that have shaped our knowledge today. A light history lesson of an interesting individual. The narration was well done and perfect for this piece. Overall an entertaining listen. I was voluntarily provided this free review copy audiobook by the author, narrator, or publisher. Before reading this book I hadn't heard of him, despite a fairly good layman's understanding of relativity and modern physics. This book is a good introduction and overview of his life and his discoveries/theories. Dirac was a theoretical physicist, based strongly in mathematical calculations (to the extent of believing that everything could be known through mathematical equations). He left the experimenting and proving of his theories to others. One of his major theories that have proven true and shaped physics is the existence of antimatter. He also did great work to reconcile general relativity with quantum mechanics. Of course he had some kookier theories that (at least for now) have been proven wrong, such as the changing strength of the gravitational force over time and his disagreement with the conservation of matter (believing that new matter is popping into existence as we go along). It seems, like many physicists, that he did his best work when young and as he got older came out with strange ideas or had trouble accepting the theories and discoveries that came after him, thus making his latter years less impressive. It seems a common thing with physicists that I have read about. The book is not in depth on his theories (its a history book, not a physics manual) but gives enough explanation to help you understand what he belied and why. It does presuppose some understanding of physics and the theories (especially relativity) but should be fairly easy for someone to follow along without too much background. Narration by Jack Wynters was good. He is well suited for this book, giving a distinguished English voice to go with the English physicist. He is clear, well paced and easy to listen to. Overall, a pleasure. Well,even 'simply' I don't get Dirac. Math...too many numbers.Jack Winters was a fine narrator.I just did not understand much of the material.I was provided this book free by the author, narrator or publisher.